In this website you can read all about our family and catch up on our various activities and our past travels. Our story Important events in our lives. Family news What's been happening in our family over the years. Recent travels Photos and travelogues from our recent trips to the Caribbean, Pacific Islands, Hawaii, Norway, Rarotonga, the UK, Europe, Israel, Egypt, Jordan, USA, Canada, Vietnam, China, Taiwan, Japan, Korea, Scandinavia, Russia, Shetland Islands and Turkey..... This also includes links to YouTube for our cruises. Ministry news What's happening in our various ministries and community activities. Bible studies This link takes you to Ross's website where there are lots of Bible studies you can freely download. It includes a study on every book in the Bible. The Cunninghams: Debbie and Fraser, with Heidi, JJ, Luke and Dan. We then flew to Sydney and took another 10 day cruise, this time on the Ovation of the Seas - the biggest ship sailing around Australia and New Zealand. We visited Fiordland, Dunedin, Wellington, Napier and Picton before heading back to Sydney. Lots of wonderful new experiences on the Ovation. Check them out in our video here: Ovation of the Seas. 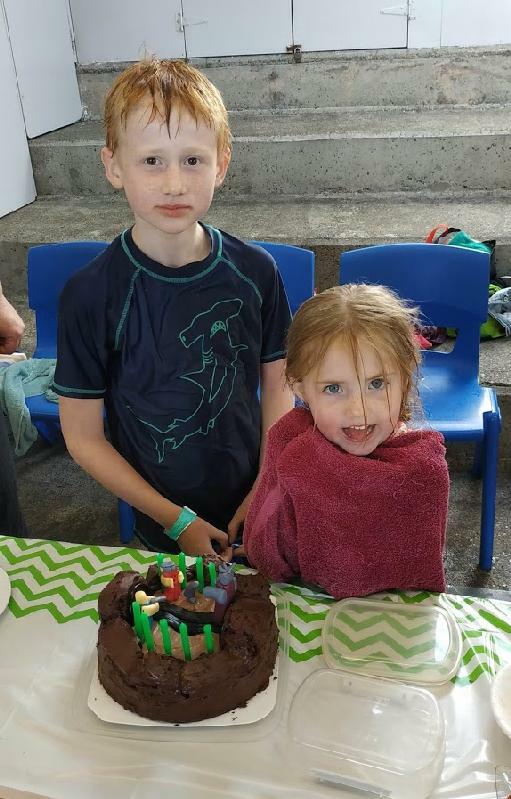 When we were in Wellington we went to Blake's 9th birthday party. Pretty good going on a cruise to a birthday party! February 2018. Sarah turned 40. Sarah and Michael with Isla and Blake. October 2018. Welcome to Billie Alice Callaghan! Phil and Mo's baby, Billie, was born on October 14th in Melbourne. Billie is gorgeous! She is very placid and is adored by her parents (and grand-parents!). Billie is our seventh grand-child. In 2018 Ross built four model ships. They were part of a series he is doing as a legacy for our grand-children. Click on the links for each model ship to watch a video showing how it was created. The paddlesteamer Emmylou. This model was built from scratch, based on photos of the Emmylou. See Emmylou The Emmylou is based on the Murray River in Echuca, Victoria, Australia. La Pinta. La Pinta was the second ship in Columbus' fleet. Together with La Nina, she brought the Columbus and his crew back to Spain, after the Santa Maria sank on Christmas night 1492. See La Pinta The model was built from scratch, based on an old photograph of a replica of La Pinta. La Nina. This was the third ship in Columbus' fleet. The model was also built from scratch. See La Nina. June 2018. We visited Melbourne to look after Debbie's children while she was away studying; then we went on a short cruise to New Caledonia on the Pacific Eden. Check out the video of this cruise here: Pacific Eden, and the daily log of our cruise here: Cruise to New Caledonia on the Pacific Eden. February 2018. We went on a wonderful cruise to Papua New Guinea on the 'Pacific Aria'. Papua New Guinea was a great place to visit. It was fascinating to see the primitive culture; the effect of the Japanese invasion during WW2, and the devastation caused by volcanoes. Check our the video of this cruise here: Pacific Aria cruise and our log of the trip here. The Cunningham and Stevens families were with us for Christmas. It was lovely to all get together again. November 2017. Ross completed his most complex ship model so far - the USS Constellation. Lots of intricate work involved! August 2017. We went on a cruise to New Caledonia and Vanuatu on the "Sun Princess". Another wonderful cruise! Check our the video of this cruise here: Cruise on the Sun Princess and our log of the trip here. Afterwards we visited the family in Melbourne. March 21 2017. Ross turned 70. Debbie and Phil came over from Melbourne (and so did Heidi and Dan - a big surprise!). We had a great party with the Youth Group and with our family and friends. February 2017. We went on a cruise on the 'Radiance of the Seas' to celebrate Ross's 70th birthday. We started in Sydney and visited Brisbane (where we met up with Mike and Gaye Carman), Cairns (where we were not able to dock due to the weather), Darwin (where we went on a tour to Litchfield National Park), Bali (where we went on a tour with taxi driver TBall); Port Hedland, and Geraldton (where we met Fiona Davidson). The cruise finished in Freemantle (where we went on tours of the city, the Swan River and Perth). Click here to read the travelogue of the trip and see photos of all the places we visited. After the cruise we flew to Melbourne for a week with Debbie's family and to catch up with Phil and Mo. Kathy completed researching the Tyson and Graham family lines (Ross's mother's family lines). This amazing piece of genealogical research can be read by clicking here: Tyson and Graham family history. It starts with Ross and goes back through seven generations. The Tyson and Graham families originally came from from Cumberland, England. You can read our 2016 Christmas newsletter by clicking here: 2016 Newsletter. May 2016. Debbie turned 40. We went to Melbourne to celebrate Debbie's 40th birthday.After a great party we looked after the children for a few days so Debbie and Fraser could have a holiday together. We survived quite well! We then had a lovely time driving from Melbourne to Adelaide, following the Murray River. See Melbourne to Adelaide 2016. You can watch the short video we made of this trip here. We love the Murray River! Then it was back to Melbourne for JJ's 10th birthday. Ross has a new hobby: making model ships! His first model was of the Marie Jeanne, a French tuna fishing boat from the early 20th century. The model was built in the same way as the original and took 4 months to construct. It is very detailed! You can watch a video showing the construction of the Marie Jeanne here. His second model was of the PS Pevensey. This paddleship was renamed the PS Philadelphia for the mini-series "All the Rivers Run". We have been on a short cruise on the PS Pevensey, out of Echuca on the River Murray. You can also watch a video showing construction of the PS Pevensey here. April 2016. Cruise to Fiji and Tonga. We went on another wonderful cruise, this time to Fiji and Tonga on the "Pacific Pearl". We were accompanied by our friends from America, LaDonna and Tony Cheatham and we sure had a great time! Read all about our cruise here. Click here to read our 2015 newsletter. October 2015. Kathy turned 60. We celebrated Kathy's 60th birthday in style! In April we went on a trip to Asia, including a 17 night cruise on the "Celebrity Millennium". (See below). In September the whole family got together at Debbie's place in Melbourne and had a great 60th birthday party. On the actual birthday (30th October) we went to Wellington and saw Peter Jackson's amazing World War 1 exhibition, followed by takeaways with Sarah and her family. Our church, Gateway Christian Fellowship, completed its ministry to elderly people in the Kapiti area and closed down after 11.5 years of faithful service. We had a huge input into the church during the last 7 years, and it was extremely enriching to be part of such a wonderful fellowship. See Gateway Christian Fellowship. We will continue to support the elderly people who so enjoy being in our home, and will now be able to have more time for our other community activities. Click here to watch the video we made which shows the history, people and ministry of Gateway Christian Fellowship. We had a wonderful holiday in Asia. We started with a lovely week in Langkawi, Malaysia, then met up with Debbie and her family on beautiful Panglao Island in the Philippines. A week later we flew to Hong Kong and joined the Celebrity Millennium for a 17 day cruise visiting Taiwan, Japan, South Korea and China. You can read all about this holiday by clicking here: Asia 2015. Blake turned 5 and has now started at Belmont School. He is sure to be a model pupil (especially as Sarah is teaching at the school!). February 2015. Visit of Norwegian family. Five members of our Norwegian family visited New Zealand and we took them on an exciting (and sometimes emotional) tour of the North Island. Together we visited the places where Kathy's grandfather, Harald Oskar Andersen, lived and worked. We also met with NZ members of Harald's family, thus completing a joining of families that begun in 2010 when we visited Norway. (See story here). Magnar and Rosa Haraldsen; Ross and Kathy Callaghan; Vera, Wenche and Roar Haraldsen. We also recorded a Christmas song and put it on YouTube. Click here to listen: Come on ring those bells. We were married on the 31st August 1974 at Glenfield Presbyterian Church, and have had a wonderful time together over the last 40 years. Amazing how Kathy hasn't aged at all in 40 years! Celebrating 40 years: Fraser and Debbie, Dan, JJ, Luke, Ross, Kathy and Heidi. August 2014. To celebrate our 40th wedding anniversary, we went on a wonderful trip to the United States and the Caribbean. We spent time in Los Angeles and Miami, then took a 2 week cruise around the western and eastern Caribbean on board the 'Carnival Glory'. Fabulous! Afterwards we spent a few days in Washington DC. What a great way to celebrate 40 years together! You can read all about this trip by clicking here. We had a lovely holiday in Port Stephens, New South Wales, with Debbie's family and then drove north to the Gold Coast and Brisbane, visiting with Geoff and Andrea Grigg, and Mike and Gaye Carman. You can watch the video of our trip to Port Stephens by clicking here: Port Stephens. Blake, Sarah, Isla and Michael. End of 2013. Cunningham family 2013. Back: JJ, Fraser, Luke and Heidi. Front: Debbie and Dan. We spent Christmas with our family in Melbourne. It was lovely to catch up with Debbie, Fraser, JJ, Heidi, Luke and Dan, and also Phil and Sarah. In November 2013 Kathy went to Hawaii to enjoy the Sweet Adeline International Competitions and to catch up with old friends. In August 2013 Ross completed writing his book "Tomorrow I'm going to disappear". The book is 'faction' - a fiction novel based on fact. It tells the story of how Kathy's grandfather, Harald Oskar Andersen, came from Norway to New Zealand in 1904. You can read the book by clicking here: Tomorrow I'm going to disappear. See below for details of the amazing way we made contact with the family Harald left behind in Norway. Meeting our Norwegian family in 2010 and again in 2012 were two of the most enriching experiences of our lives. Harald died over 50 years ago but his legacy continues in the new relationships we have established between his families in Norway and New Zealand. In June 2013 we went on a wonderful trip to the Pacific Islands.First we went on a 10 day cruise to Vanuatu and New Caledonia on the 'Pacific Pearl'. The cruise was brilliant and we had good weather (and calm seas!) all the way. Next we flew up to Fiji and stayed at the Smuggler's Cove resort, just out of Nadi. What a gorgeous place! Beautiful beaches, lovely sunsets, plenty of interesting activities.... We loved Fiji! Click here for a full description of our trip to the Pacific Islands: Pacific Islands 2013. Click here to watch our video of the cruise on the Pacific Pearl. After a week in Fiji we flew to Melbourne to look after the grandchildren while Debbie was in New Zealand, and then enjoyed a reunion at Glenfield Presbyterian Church (where we were married in 1974). In April 2013 Phil and Sarah left for Melbourne, Australia. They sold their NZ business and set up a new business selling badges and T shirts online and at youth conventions. Now two of our children live in Melbourne so we will no doubt be visiting there quite often! Sarah and Michael's daughter Isla Grace Stevens was born in April 2013. Isla was 4.32kg and came into the world quickly and easily. Blake was rapt to have a new sister and Granna and Poppa to have a sixth grand-child! Our family all got together for Christmas 2012. Click here to watch the video of our Christmas celebrations: Christmas 2012. Here is our family photo. Front row: Dan, Sarah, Phil, Luke, Ross, Kathy. In September/October 2012 we went on a great Cosmos tour of Central Europe visiting Germany, Poland, Slovakia, Hungary, Czech Republic and Austria. Read about our trip here and watch the amazing video we made here. On our way home we stopped over in the United Arab Emirates, visiting Abu Dhabi and Dubai. Click here to read about this visit or watch our video here. Before the Cosmos tour we had a wonderful time in Norway catching up with family we met when we were there briefly, two years ago. (See below for the amazing story of how this came about). You can read about our visit to Norway here.and watch videos here: Folk and Viking Museum, Bringing in the sheep, Life in Norway. Visiting the Valdrez Mountains. On our way to Norway we had a week in Hawaii, cruising on the Pride of America. You can read all about this trip here. You can watch the video for this trip by clicking here: Hawaii. Debbie and Fraser's new baby Dan Caleb was born on the 29th August 2012. A new brother for JJ, Heidi and Luke! In March 2012 we had a wonderful holiday in Rarotonga. You can read all about this trip by clicking here. In 2011 our travels took us to America. We started with a few days in New York, then tried to find information about Kathy's great, great grandfather in Connecticut. After this we visited with friends in Kansas and in Oregon. Next we went on a Gaither Gospel Cruise to Alaska. How wonderful! Click here to read the daily log for this trip. The meeting with the family in Norway was a very special experience! Kathy had been researching the life of her grandfather, Harald Oskar Andersen. What a fascinating story it turned out to be! Up till recently we thought Harald had come from his home town of Nannestad, Norway in 1904, jumped ship in New Zealand and that his ship had sunk afterwards. Kathy's research at Archives New Zealand showed that Harald was actually put in prison when he reached New Zealand for stealing a suit, and she was able to obtain a photo of him and lots of interesting background information. You can read the article Kathy wrote about this in the NZ Genealogist here: NZ Genealogist March/April 2010. (The file will take a little while to download). We decided to visit Nannestad on our upcoming trip to Norway and thought that just one day there would be plenty, as the only thing we knew about Harald's past life was where he was born. We knew of no family in Norway. Just before we left home Kathy wrote to a local newspaper in the area where Harald lived to see if they were interested in a story, either about him or about her trying to find her Norwegian roots. She included the article from the NZ Genealogist. The editor said "Yes" and passed the story onto a reporter to write and publish. What happened next is incredible! The reporter got a call from his own cousin, who had seen the article, telling him that their great grandfather had the same name, date and place of birth. Could this possibly be the same man? They started searching records and found that indeed their great grandfather and Kathy's grandfather were the same man!! So not only was the reporter a relative, but we had now discovered a whole new family in Norway! We didn't know they existed and they didn't know we existed! We soon had many emails from our very excited Norwegian family with lots of photos. It appeared that Harald had 2 children before he left Norway and the offspring of those children had finally discovered what had happened to him. They thought that he had 'disappeared' in 1903 and was possibly lost at sea. It was strange to see photos of strangers from the other side of the world that looked like Kathy's father! We then came on another interesting aspect of the story. One of the older Norwegian family members described something that had never been mentioned before. Apparently Harald's son had said that Harald and 3 other men had got in a fight in 1903 and a man had died. Harald must have thought he was guilty of murder and got a job on a ship so he could 'disappear'. As it turned out the man died from hitting his head and no one was charged with his death, but Harald never knew this. He had already disappeared. No-one in Norway knew where he went and (to our knowledge) Harald never contacted any of his family in Norway, not even his mother or partner Anna. Harald's Certificate of Discharge told us that he ended up in NZ and that he 'failed to complete his voyage' in 1904. Kathy later learned that he had been put in jail when he arrived in New Zealand, for stealing a suit. Harald married Andrina Louisa Gertrude Sandison (Kathy's grandmother) in 1916 and they had 6 children (including Eric, Kathy's father). Harald had not married the woman with whom he had the children in Norway so he was not a bigamist! For more information about Harald and Andrina and their family, go to the 'Grandparents' section of our website. Click here: Grandparents. Sarah and Michael's son Blake was born in March, 2010. Blake was our 4th grandchild. Ross is playing golf again and is playing quite well despite his bad back. He got down to a 7 handicap and even had a 69, something he last did well over 50 years ago. He has also beaten his age - having a 70 when he was aged 71. Not many golfers have done that! Kathy is no longer a Sweet Adeline. This was a major decision after 15 years of singing barbershop. She values how much she learned, and the friends she made through the barbershop craft. Kathy is now singing with the Kapiti Women's Choir. Kathy is still working on researching our family history. After a time on the committee for the Kapiti Genealogical Society she now does genealogy research for others, which takes up quite a lot of her time. We are now fully retired and loving it. Retirement gives us time for our community work - leading our 'Youth Group' and providing entertainment for elderly people. We show travel movies, lead singalongs, run soirees and provide Church services in Kapiti Retirement Villages and rest homes. See our Entertain Kapiti website for details. We are also able to travel more, especially visiting the family in Melbourne and going on cruises. See Recent travels. Many of our travel videos are becomingvery popular on YouTube.